Damien McGrane. Picture Eoin Clarke/www.golffile.ieDamien McGrane fired a slightly chilly 66 to lead the Ballantine’s Championship in Korea but stablemates Shane Lowry and Graeme McDowell went from the sublime to the ridiculous on opposite side of the world. Lowry brifely led the European Tour event when he raced to six under after 12 holes only to finish with three bogeys and a triple bogey for a level par 72, going out in 32 and coming home in 40. McDowell was three under through 11 holes in the Zurich Classic of New Orleans on the PGA Tour but then mixed three birdies with three double bogeys in his next six holes and posted a one over 73. Lowry still finished the day inside the top 40 at Blackstone Golf Club in Icheon but McDowell, who avoided a hat-trick of missed cuts with an erratic display in Hilton Head last week, was well down the field and six shots behind clubhouse leader Bubba Watson. McGrane, who was playing alongside Lowry, was suitably pleased to make eight birdies and just two bogeys. One clear of Chile’s Felipe Aguilar, England’s Richard Finch and home favourite Park Sang-hyun, the 40 year old said: “I made plenty of birdies and I putted nicely. I holed everything inside 15 feet, so I made two bogeys which were out of nowhere really but that’s golf I suppose. McGrane has not had a top-20 finish yet this season, but his 22nd place at last week’s Volvo China Open – where he picked up his only European Tour title three years ago - was his best of the campaign. “I hit a few good iron shots there at the end, and I hit good putts, and obviously I like to finish strong and I finished strong there today,” he added. Of the rest of the Irish in action in Asia, Michael Hoey and Paul McGinley shot one-under 71s and Gareth Maybin a 72. Star attractions Lee Westwood, Ernie Els and Ian Poulter did little to impress. World No 1 Westwood could only manage a 72 as Els shot 73 and Poulter a 74. Poulter was miffed during his round because he caught a fan “stealing” water reserved on tees for players and caddies. Graeme McDowell could miss the $9.4 million Players Championship after crashing out on his Ballantine’s Championship defence in South Korea. Graeme McDowell shelters from the heat during the final round of the Barclays Singapore Open. Picture by Eoin Clarke/www.golffile.ieGraeme McDowell and Shane Lowry headed for Japan in positive mood after finishing tied 13th in the Barclays Singapore Open. Alex Noren has a one shot lead in the Ballantine’s Championship in Korea. Picture © Getty Images.Damien McGrane produced a fighting performance to make the cut with ease then battled back from a poor start to scorch up the leaderboard in the Ballantine’s Championship in Korea. Shane Lowry plays to the sixth in the second round of the BMW PGA at Wentworth. 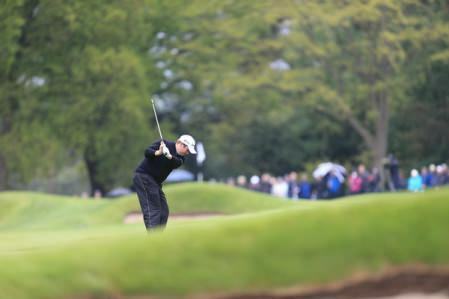 Picture: Fran Caffrey/www.golffile.ieRory McIlroy - cut. Luke Donald - cut. Graeme McDowell - cut. It might be bad news for the European Tour’s wintry BMW PGA Championship that three of the four members of the world’s top 10 to make the trip to the stockbroker belt suffered a Black Friday, but it’s good news for Shane Lowry.